In Featured, Innovation, Posts, Workplace Learning & Development. A good interview tells a great story. It’s an opportunity to complement your learning objective with a subject matter expert who can paint a picture with their words, provide knowledge to the listener and leave them with a takeaway (and a desire to return for more). The act of interviewing is a truly fine art, and many famous (and infamous) radio, talk show and podcast hosts have become known for their exceptional inquisitory techniques. Before you sit down in front of your guest speaker, research them thoroughly. Ask for a C/V, resume, LinkedIn profile or website and schedule a pre-interview call or coffee to learn about the small-but-crucial findings that distinguish them in their field. What makes them the expert? What makes them interesting? Find out in advance so you can be prepared with questions tailored to uncover these hidden gems without too much on-air digging. After your initial homework assignment, you’ll be ready to craft a list of questions that extract the quality content you uncovered during your research. Be sure to position the questions in a way that flows, starting with introductory questions that clue the listener into the bottom line, mixing in open-ended questions that give the guest a chance to tell that engaging story, and circling back to important points with probing follow-up questions. Never ask a “yes” or “no” question, and refrain from blurting out two questions at once (sometimes we get excited). A well-produced podcast isn’t simply the product of a microphone, a recorder and a list of questions. Quality podcasts need detailed scripts. Once you’ve compiled your list of questions, insert them into a script template that you can reuse for future material. A simple script template can be found here. Following a concise script that you’ve sent to your guest in advance ensures a shared vision for the podcast, which is a much more efficient way of squeezing out the content you know you want to elicit. It also aids in more seamless back-end production, as you piece the interview together, overlay sound effects and music and are able to visualize the finished product from the get go. 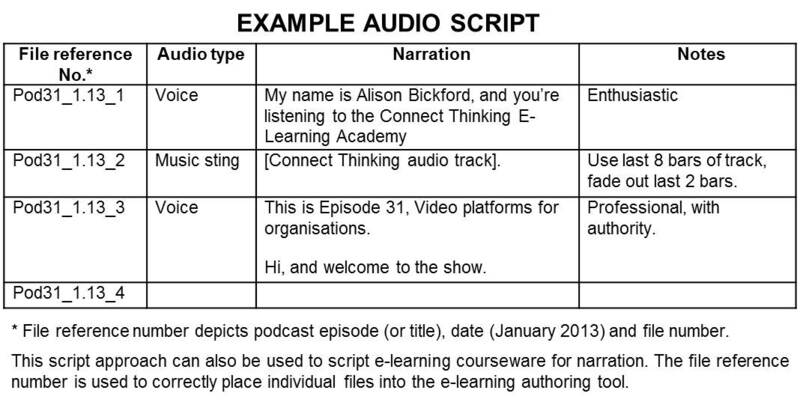 You can mark up up the script as you move through the podcast to ensure all points are addressed. Spending a few minutes in casual chit chat (while recording) is a great way to set a more informal tone that can carry onward for the rest of the interview. You don’t want to dive into the meaty questions immediately, as you risk the chance of the guest sounding rigid and unprepared. Take some time to break the ice and you might be surprised to find that quality content drips from even this informal warm up. Without the ability to lean on visual stimulation, you’ll need your podcast to illuminate and captivate with words. It’s up to you as the host or narrator to tell the listener why they should care. You can do this with an attention-grabbing intro full of fascinating facts, figures, stats and even a jaw-dropping audio story. From there, lead them into the introduction of your guest speaker who can elaborate on what’s already drawn them in. Use your script of pointed questions to squeeze out content that reinforces your intro and is sealed off by your conclusion. As important as it is for you to set the tone and draw the listener in, once the questions start to flow, it’s important to leave space for the speaker to divulge. Temporary moments of silence often feel like hours when you’re conducting an interview, but remember the power of editing to remove these brief voids. During them, the speaker will have some of their best, most candid thoughts. These improvised moments resonate with listeners more than a staged monologue ever can. Conclusions give closure and, if conducted properly, leave the listener wanting to return for more. Be sure to carve out space toward the end of your interview for the guest to address points that don’t feel finalized (remember – you can edit the order later). Use probing questions to elicit any content you were unable to cover (refer to your marked up script to see if anything is missing). Offer thoughtful plugs of where the listener can find more information about your guest and your podcast series. What happens before (research) and after (editing) the podcast is often more important that what happens when you hit record. Take the script, the raw audio and any looming thoughts you have and sit down to construct a podcast that “tells the listener why they should care.” If necessary, circle back to the guest to clarify any points that don’t seem concise or any responses that feel choppy. Odds are, they will be happy to comply with your request. You are showcasing their expertise, after all! Overlay enticing sound effects and excerpts that are relevant to your topic. Use a quality narrator (if it’s not you) who can draw the listener in and leave them with a takeaway. Above all else, don’t be afraid to make mistakes. A large part of podcasting is trial-and-error. You have the production tools to revamp your audio, so be sure to plug and play until you’ve squeezed out that gold standard content. Tagged Advisors, assessment, blended learning, communication, communications, digital learning, ed tech, elearning, Global Talent Advisors, how to, HR, human resources, innovation, interview, interviewing, interviewing 101, Learning, learning and development, listicle, marketing, mass media, media, podcast, podcast content, podcast production, podcast script, podcasting, Talent Management, tech, technology. Next:What is the Right Employee Survey for Your Workplace? The Long, Short & Supershort of It.